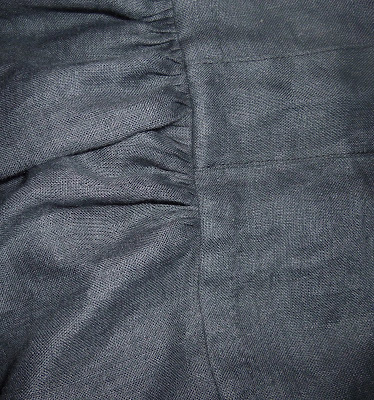 I have a rather large piece of dark grey linen in my stash, which has been there for years. 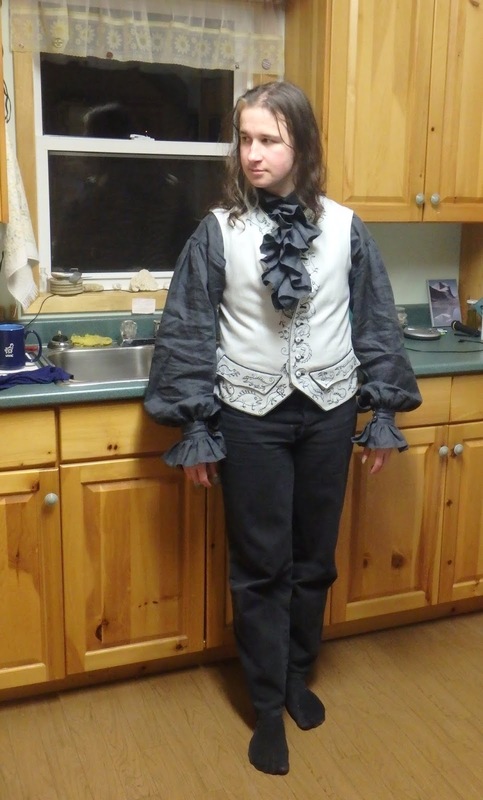 It's too fine and loosely woven to make breeches or waistcoats out of, but it's just right for shirts. 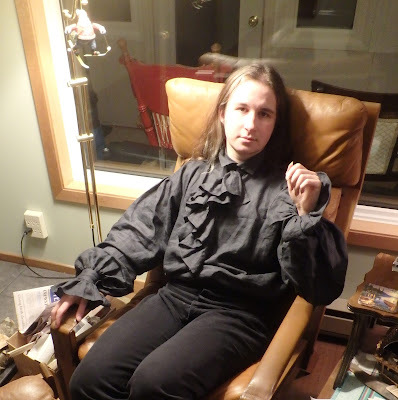 Dark grey and black aren't accurate colours for 18th century shirts, but it's just for everyday wear, so that's not so important. I cut this out about 6 months ago, let it sit on The Pile for a while, and finally finished it last week. I won't bore you with the construction details, as they are much the same as all my other shirts. 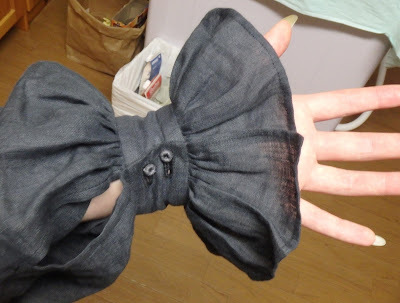 It's mostly machine sews, with hand finishing on the cuffs, collar, and ruffle hems. And on the small strip that finishes the inside of the sleeve attachment seam. 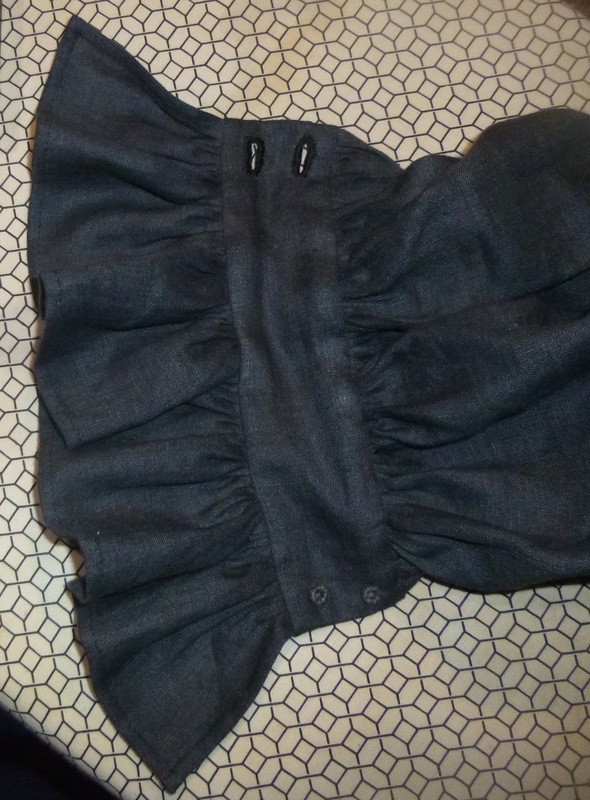 I am quite annoyed with myself for putting the ruffles on the wrong way 'round. I was all finished the front slit and attaching the collar before I realized that the hems faced outwards instead of inwards! What's more, I had pinned it on and checked, and then taken it off and turned it over because I thought I'd put it on the wrong way. How foolish! I was awake way too late sewing at the time, so I blame it on lack of sleep. The shirt took a total of 16 hours and 2 minutes. but I think this one looks good. Underarm gusset with the seams all nicely finished. The buttons are thread buttons I made several years ago from grey linen thread, in a slightly lighter colour than the shirt. 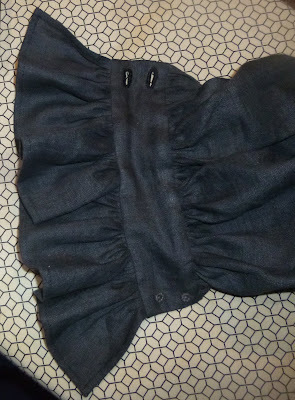 The buttonholes are done with black DMC cotton pearl. I think the ruffles are a bit too long. I can't remember, but maybe I cut them intending to do a wider hem? Or maybe it just looks odd because the shirt isn't white, I'm not sure. It's a wee bit scratchy, the linen will soften up with a few more washes. 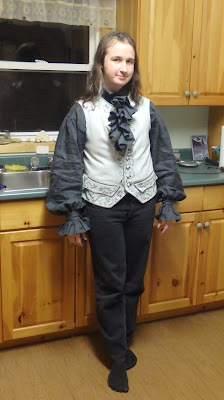 I think it looks quite nice with my monster waistcoat, what with it being equally inaccurate. I still have a lot of this linen left, and I don't really want to make more shirts out of it, so perhaps I'l do a nightgown or two. I've missed the last two HSM challenges, but I'm sure to finish the November one since it's a small and simple item! Your outfit looks really nice. I'm looking forward to seeing your next HSM challenge. Thank you Mamoo! It will be finished before the month is over, and then the December one is "neglected challenge" so I can finish one of the earlier ones that I didn't do! I have an untelated question. What the name of the painter/painting at the top of the page. 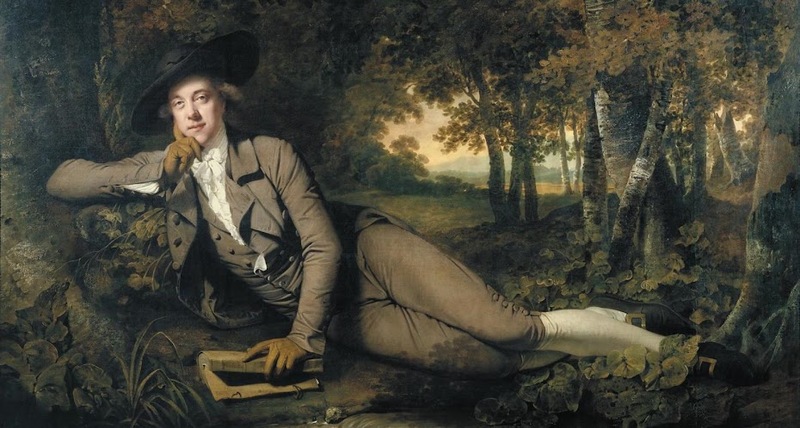 It's Sir Brooke Boothby by Joseph Wright of Derby, 1781. 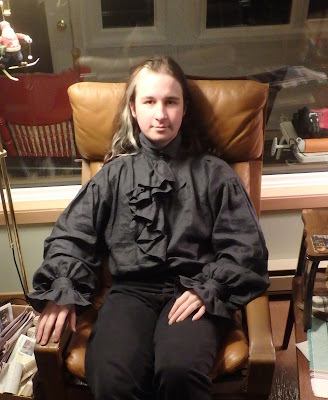 I know this is a shirt post, but if you wouldn't mind I have a question about breeches. 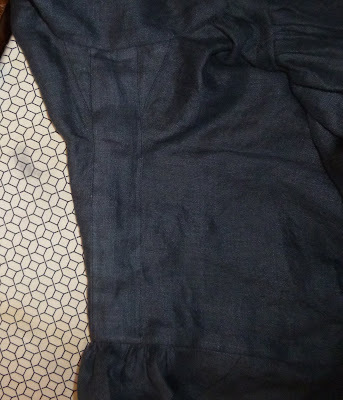 I'm making breeches out of polyester felt (I know, the horror, polyester) to practice my first breeches since it won't unravel, and I'm curious how you make a rear baggy? 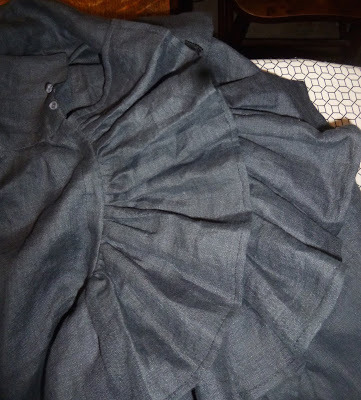 I put two large pleats into the sideseams to compensate for the four extra inches of sitting room, and that probably isn't accurate. 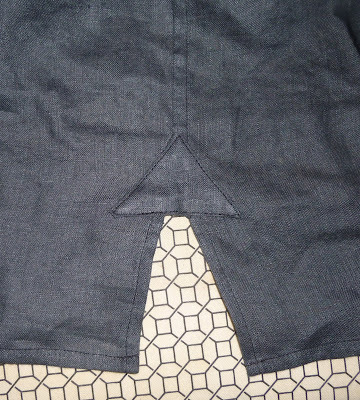 (I had to add the four extra inches after I cut the leg pieces out because I forgot to add it to the pattern, at least it's on the back and not the front.) I'm probably not constructing these as accurately as I could, since the felt I'm using is so thick I can't turn under the edges of the fall plackets on a machine. I do suppose I could turn them under by hand though, since I have a good quarter to half inch extra on the edges. The waistband is in two halves, and is made adjustable in the centre back either by a buckled tab or by 4 lacing holes. It sounds like it would be very difficult to gather this felt into a waistband, so perhaps a few small pleats in the rear would suffice. Ah, thank you! 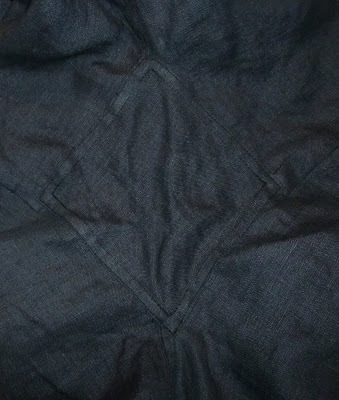 I did get the waistband correct, although I put in six eyelets instead of four, as I thought it would give me more room for precise adjusting. If my computer camera behaves I might be able to get a decent enough picture of the back to show you, if you don't mind. Sure! I'm always happy to talk about sewing. My email is on the about page. Thank you! I sent you an email, it might've ended up in your spam folder.